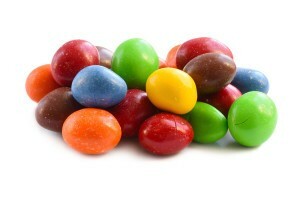 The variety of ways you can enjoy this delectable colored chocolate candy is limited only be your imagination. These eye-catching pops of color are perfect as part of a party table spread. They're a great way to make snack mixes sweeter and more visually exciting. Use them in a variety of dessert recipes or eat them by the handfuls. Milk Chocolate (Sugar, Cocoa Butter, Whole Milk Chocolate Liquor, Lactose, Lecithin (An Emulsifier) and Vanillin, Sugar, Coloring Yellow #5 , Yellow #6, Blue#2, Red #40, Blue #1. Sorbitol, Methyl And Propyl Parabens And Edta. Corn or Peanut Oil, Corn Syrup, Gum Arabic, Confectioner’s Glaze (Shellac) And Carnauba Wax, Dextrin. One bag contains about 450 pieces. 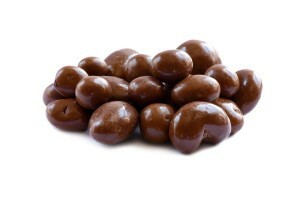 This is the perfect size and perfect price to make your own trail mix.